Top U.S. Commander In Afghanistan Accuses Russia Of Aiding Taliban : The Two-Way In an interview with the BBC, U.S. Army Gen. John Nicholson has reiterated charges that the Kremlin is providing arms to the Afghan resistance. Moscow calls the accusation "idle gossip." 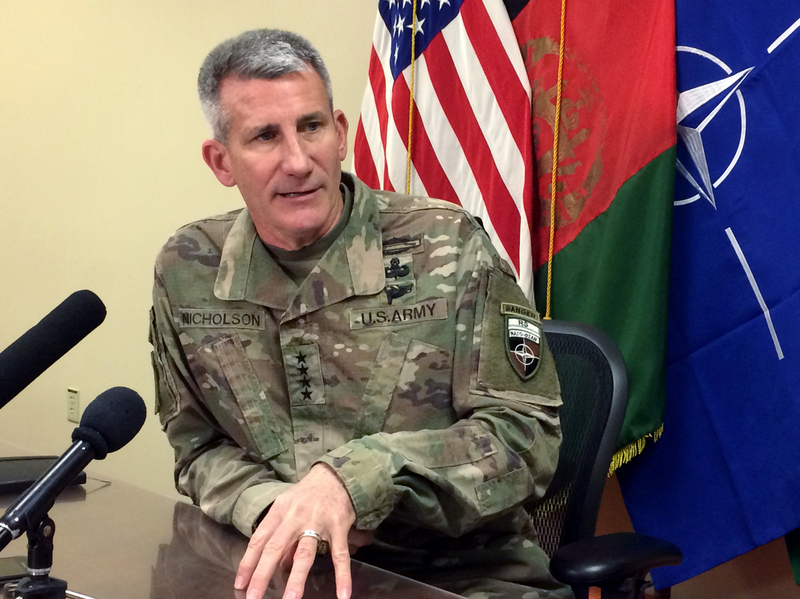 Gen. John Nicholson, the top American commander in Afghanistan, speaks to reporters last week at Bagram air base north of Kabul, Afghanistan. As NPR Pentagon correspondent Tom Bowman reported last year, it is not the first time that the four-star general has made the accusation. Last year, Secretary of Defense Jim Mattis also discussed the concern. A statement by the Russian embassy in Kabul dismissed Nicholson's comments as "idle gossip." Officials in Russia have said they only have limited contacts with the Taliban and that they are aimed at encouraging peace talks and protecting Russian citizens. Afghan officials last year also called on Moscow to halt its support for the Taliban. In October, Brig. Gen. Mohammad Naser Hedayat, the commander of the Afghan army's 207th Corps, said Russia was "actively meddling in Farah [province]." "We have seized Russian-made weapons, including night-vision sniper scopes," he said. As The Guardian wrote at the time: "Russia's recent push for influence in Afghanistan follows a pattern across the region, where Moscow has challenged American influence in Libya, Turkey, Syria and the Gulf. But it also offers an echo of history for Afghans who since the 19th century have seen their country treated as a battleground for rival foreign powers." "If Russia is cozying up to the Taliban — and that's a kind word — if they are giving equipment that we have some evidence that the Taliban is getting ... and other things that we can't mention in this unclassified setting? And the Taliban is also associated with al-Qaida? Therefore Russia indirectly is helping al-Qaida in Afghanistan," said Nelson. "Your logic is absolutely sound, sir," Nicholson replied. At the time, Nicholson said the Russian operations in Afghanistan had resumed the previous year . Russia has a long and tortured history in Afghanistan. In 1979, Soviet forces invaded the country following a coup that overthrew the Kremlin-backed government there. Local fighters, who called themselves mujahedeen, formed a fierce resistance to the Soviet occupation. During the Reagan administration, the U.S., with the help of Pakistan, funneled hundreds of million of dollars' worth of weapons to the Afghan resistance. The 10-year conflict in Afghanistan, which devolved into a quagmire that cost 15,000 Russian soldiers, is widely viewed as a major contributing factor to the collapse of the Soviet Union.